The film opens with a group of strangely colored humanoids emerging from tanks in a laboratory. The scientists responsible for these creations are congratulated by their employer, Mr. Jaguar, who plans to make these "Bio-Humans" into the strongest fighters on Earth. Despite warnings from his cousin, Men-Men, Jaguar laughs maniacally as Broly wags his furry tail in his tank. As Hercule (Mr. Satan) hasn't yet paid Android 18 the prize money she demanded for letting him beat her in the 25th World Martial Arts Tournament, she begins smashing Mr. Satan's mansion up, particularly his undeserved prizes from the tournament. Hercule, cowering, tries to tell 18 that he hasn't get the money yet, but she doesn't believe him, and continues to ransack his home. His screams of fright are heard by Goten, Trunks, Krillin, and Marron, who are waiting for 18. Hercule is visited by Men-Men, who claims to be the cousin of hercule's old martial arts rival, Jaguar. It seems that Jaguar is blackmailing Hercule into visiting his laboratory island to fight his bio-fighters. Hercule agrees, and departs with Men-Men, followed by Goten, Trunks and 18; 18 to ensure that Hercule does not cheat her again, and Goten and Trunks out of excitement over the Bio-Warriors. Upon arriving, Hercule is coldly greeted by Jaguar, who sets up a tournament for him to fight the bio-fighters, but when they demonstrate their incredible fighting abilities, they are more than which Hercule can handle, Goten, Trunks, and 18 intervene. Goten and Trunks are then confronted by a familiar face: The Priest from Natade Village whom they met in the previous movie. Enraged, Jaguar reveals his greatest weapon: a Super Bio-Fighter. But when Goten and Trunks see the Super Bio-Fighter, they recognize him as none other than the Legendary Super Saiyan himself, Broly. They confront the priest, who tells them that he sold Broly's frozen blood to Jaguar, and that the Super Bio-Fighter is Broly's clone. Goten and Trunks prepare to destroy Broly before he can be revived, but seeing Goten has already awakened Broly's Saiyan instincts and his vengeance against Goku. He breaks out of stasis, only to be drenched in the bio-liquid and turns into a horribly deformed, slime covered bio-mutant, giving him the name Bio-Broly. Jaguar commands Bio-Broly to attack Hercule, but 18 intervenes at the last minute, only to get pounded by the Bio-Saiyan. Just before Bio-Broly can kill Hercule, Trunks intervenes and save him in time. They then attack Bio-Broly head-on, and prove to be an equal match for the Bio-Saiyan, until Goten abandons the battle to save trapped scientists from the flooding of a dangerous bio-liquid which absorbs anything with a different genetic structure to its own and grows stronger. As Bio-Broly pounds Trunks around, 18 recovers and tries to stop him, but she too is beaten. Just before Bio-Broly can kill her, Krillin shows up in time and rescues 18, but Bio-Broly finds them both and almost kills them. Goten and Trunks then fight Bio-Broly again, but they get seriously pounded, and Bio-Broly almost kills Goten until Trunks devises a way to get rid of the menace. Trunks manages to lure Bio-Broly into a corner, where he blasts the bio-liquid tanks, causing them to shower on Bio-Broly and supposedly melt him. Unfortunately, this only makes the bio-liquid more powerful and his power rises, and it soon starts to flood the entire island, and possibly the whole planet. Goten, Trunks, Krillin and 18 manage to get as many people as they can out of the lab, including the reluctant Jaguar and Men-Men, who want to die shamefully along with their deadly creations, but Trunks rescues them anyway, and Hercule manages to escape by jumping into the water. To everyone's surprise, the bio-liquid seems to be solidifying by touching the sea water, so Goten, Trunks and Krillin use a triple Kamehameha Wave to blast the water by the island so high that the entire island is flooded with sea water, which solidifies all the bio-liquid. Unfortunately, the celebrations are cut short when Bio-Broly emerges from the sea as a giant. However, as fast as Bio-Broly emerges, he then turns to stone, due to having been drenched in sea water. 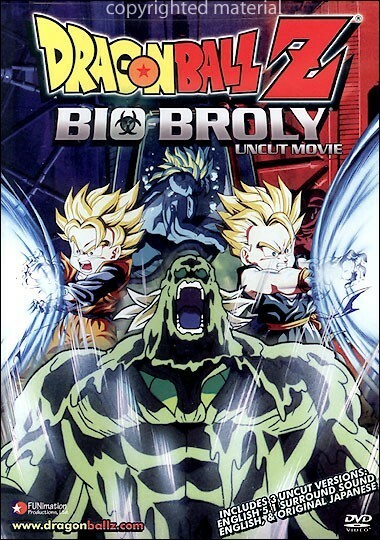 Seeing their chance, Goten and Trunks blast the gigantic Bio-Broly statue into oblivion, ridding of Broly for good. Hercule emerges from the sea water, calling for help. Laughing, 18 says that she will help him if he promises to pay her 100,000,000 zeni. Fuming, Hercule swims off.